Yogi Berra dies: Yankees catcher was 90. 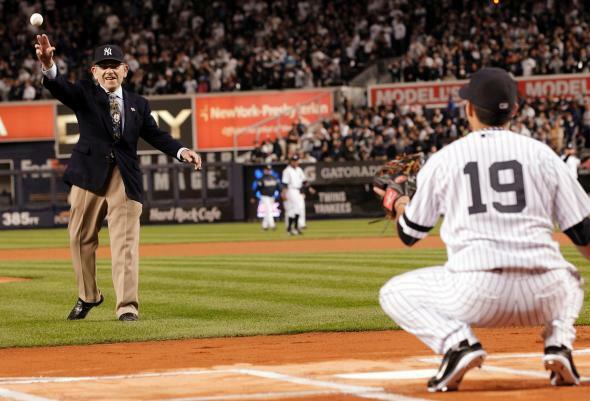 Yogi Berra throws out a ceremonial first pitch at a New York Yankees playoff game against the Minnesota Twins on Oct. 10, 2010. Legendary New York Yankees catcher Yogi Berra, a member of the baseball Hall of Fame who was also credited with a number of famous malapropisms and non sequiturs that he may or may not have actually originated, has died at age 90. Berra, who was born in St. Louis, lived in northern New Jersey. The New York Times obituary for Berra is long and impressively detailed, chronicling his path from St. Louis’ American Legion teams to the minor leagues to the Navy—he participated in the invasion of Normandy and was awarded a Purple Heart after being wounded in Marseilles—to New York, where he won 10 World Series as a player and became a well-known personality. As a Yankee, Berra became a fan favorite, partly because of his superior play — he batted .305 and drove in 98 runs in 1948, his second full season — and partly because of his humility and guilelessness … Berra was a hit with sportswriters, too, though they often portrayed him as a baseball idiot savant, an apelike, barely literate devotee of comic books and movies who spoke fractured English. So was born the Yogi caricature, of the triumphant rube. Berra was involved with some of the most famous moments and characters in baseball history even after retiring; he was a first-base coach for the 1969 “Miracle Mets” and was later hired and fired as Yankees manager by infamous team owner George Steinbrenner, creating a feud that lasted 14 years before Berra returned to Yankee Stadium on the day David Cone threw a perfect game. Berra was married to his wife Carmen, who passed away in 2014, for 65 years.